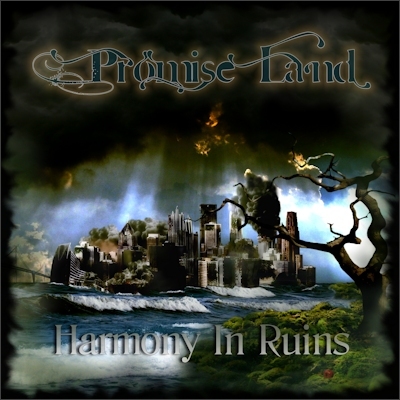 Immediately following the Online Event, Promise Land opened up Pre-Orders for highly anticipated album, ‘Harmony In Ruins‘ which was announced for a Aug 5th release date. In addition, the new website was also made public after the event where people could pre-order the album. Album Cover and Track List Revealed! Artwork description: The artwork tells the story of the title and lyrical theme of the album: Harmony In Ruins. The ‘Tree of Life (which now appears dead or dying) coming out of the scroll and showing the result of the fall in the Garden of Eden into modern times, which is depicted by the destroyed city across the water. Artwork design by Promise Land’s very own, David Michael. XNilo Records has released an Official Teaser-Video for the upcoming, long awaited, Promise Land album. In addition, via the teaser-video, the Official album-title has been made public: Harmony In Ruins. This is the first teaser-video of more to come as we draw closer to the release. No release date has been announced yet, but it is on the horizon.